Attic red-figured column-krater attributed to the Orestes painter. 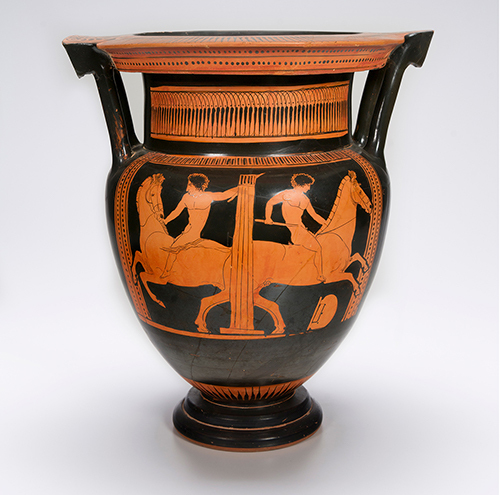 The exhibition, 'The Horse in Ancient Greek Art', will be on show at the National Sporting Library and Museum, and the Virginia Museum of Fine Arts. It will include a number of objects from private collections. I hope that the full collecting histories will be provided. I looked up the Attic red-figured column-krater attributed to the Orestes painter (and featured on the exhibition website). It surfaced in the Fortuna gallery in Zurich in 1980 (and was re-offered in 1983), and then was for sale in the Royal-Athena Galleries, New York in 1983. It was then offered through the Old World Galleries, New York before being auctioned at Christies (June 8, 2004, lot 328) where it was sold for $47,800. It then passed into a Virginia private collection. What was the collecting history of this krater prior to 1980? I note that other kraters attributed to this painter were found at Agrigento, Camarina (two), Chiusi and Spina. Where was the Virginia krater found? And when? Its fairly complete nature suggests a tomb is quite likely. This exhibition reminds us of the material in the Virginia MFA that has been identified by Cambridge-based Dr Christos Tsirogiannis.